Depression is a clinical condition that means the sufferer experiences a constant sense of hopelessness and sadness that goes far beyond the natural states of negativity that most people feel as a result of a sad event. There are many causes, including hormonal fluctuations, stress, and lifestyle habits, so naturally, there is also a wide range of treatment options. Most people are familiar with the usual treatment options, but there are also some more unusual ones. Read on to find out about some of the uncommon treatments for depression. This therapy involves the sufferer being exposed to bright light for a certain amount of time every day. The reason for this is that light is believed to affect the levels of serotonin and melatonin in the brain, and these hormones have a huge effect on mood. Preferably, the bright light is natural sunlight, as this is the light that the brain has evolved to deal with, but in the absence of this, fluorescent lamps that emulate the brightness of the sun are still seen as better than darkness or incandescent lights. Although a popular form of exercise, it is not always viewed as a treatment for depression. However, many sufferers have found it to be very helpful. The reason it can reduce depression is probably due to the fact that it reduces stress. The relaxed state that a person will find themselves in as a result of the breathing exercises and gentle stimulation of the muscles will lead to a reduction in heart rate and blood pressure, two physiological responses that are known to worsen the stress response. 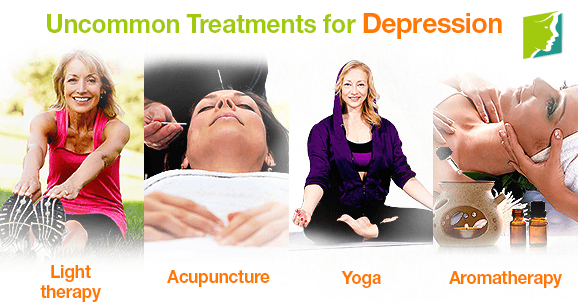 There are even studies that have shown yoga to be a useful treatment for depression. The olfactory sense is often overlooked, but it can be used when looking for treatments for depression. Aromatherapy is the use of various smells to induce physiological and emotional reactions. There is a growing body of research, though still inconclusive, that suggests aromatherapy can help reduce depression, and certain essential oils are known to balance and relax the nervous system. There are a small number of studies that suggest acupuncture is effective in alleviating depression, making it an unusual but seemingly useful treatment for depression for some. This therapy developed within traditional Chinese medicine and is based on the principle that stimulation of certain areas of the body with a needle will improve organ functioning. Many people find acupuncture is an excellent tool against tension and stress. Depression is a debilitating illness and can affect all aspects of life, so most sufferers naturally seek treatment but want to know all the options available to them. Trying some of the uncommon treatments for depression listed above might help on their own or as a complement to current treatments and remedies. If depression persists, it is recommended to contact a physician as soon as possible. Many menopausal women suffer from depression, but this should not be seen as a normal part of life. Keep reading for affordable ways to treat depression.